It is written about man that he was created in God’s image. God is the creator. Thus, it follows that man is a creator too. He is called to cooperate in the implementation of the divine creation plan. Such a true way of creating is, however, only possible if the personality-soul, the soul and the spirit-soul form a dynamic trinity. That situation will be reached at the sixth creation day, which is described in Genesis 1. The issue is not God here, or the Elohim, as in Genesis 1, but the Lord God, or yhvh, the name that may not been said, but in spite of this is pronounced as Yahweh or Jehovah. This deity is therefore at a lower level than the Elohim because of his smaller operating range, which is nevertheless incredibly huge. Michelangelo Buonarroti (1475-1564), one of the most important artists of the Italian renaissance, has splendidly portrayed the formation of man on the basis of the bible verse mentioned, on a world-famous and impressive fresco in the Sistine Chapel in Rome. On this fresco Adam lies in his original nudeness on the black soil of paradise. He has a powerful body and has a look of expectation in his eyes which have just opened after the sleep of unconsciousness. Adam is inspired by the touch and the breath of yhvh, from his abode in heaven and who is carried by the strong wind of ruach Elohim (see image 15). Pure majesty radiates from his forehead and in the folds of his robe angels float, manifestations of the spiritual hierarchies that are involved in the implementation of the divine creation plan. Although in this mural Adam is represented as a man with a physical body, in fact he has as yet no material body in this situation and is still an androgynous living being; masculine as well as feminine. The separation of the sexes has thus not yet taken place and Adam, in this situation, only has the disposal of subtle bodies. Adam and his wife Eve only receive a material body, indicated as coats of animal skin, when after the fall they are banned from paradise and the entrance to the paradise and the tree of life is guarded by an angel with a flaming sword (Genesis 3). 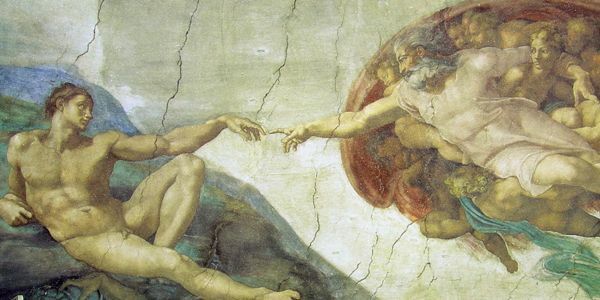 This fresco on the creation of Adam enables us to connect in a totally different way with the creation myth – the text of which is in Genesis 2 – and thereby also with the world of the soul, the world of the concrete archetypes. This masterpiece of Michelangelo, in which God is represented as an old man with a long beard, is nowadays regarded by many people as a great artistic achievement, but at the same time as a very naïve image. It is, however, the question whether it is naivety that we see here. The image of the old man with the beard is after all, just one of the many ways in which the Sacred One may be experienced. We must not worship such an image, of course – it would be an idol in that case – but it can certainly evoke a warm feeling that makes us receptive for the world of the soul, that is expressed in the true, the good and the beautiful. We can also see the fresco as an expression of the fact that we can reach out for the helping hand that is offered from the divine world. God does not forsake the work of his hands (Psalm 138:8). Artists can bring beauty to our awareness. There are many forms of art, like sculpture, architecture, dance, music, poetry, prose and painting. In some works of art, the influence from the world of the soul can be experienced. That is expressed in the following seven quotes from artists. The reformation, mainly set in motion by Martin Luther when he nailed a placard with 95 theses on the door of the castle church of Wittenberg, led to an aversion within Protestantism against religious scenes. Particularly as a result of actions by the followers of John Calvin, this degenerated into the so-called iconoclasm with its mass destruction of sculptures and paintings in Catholic churches. Certain arguments against religious visual arts of the protestants at that time were certainly solid, but by rejecting almost all religious visual arts, the baby was thrown out with the bath water. From an imageless and very abstract conception of God it is difficult to be receptive for the Sacred in a kind of spiritual love relationship. Belief will freeze in this way, because it is uninspired, and hence one cannot be a living channel for the flow of divine grace in this world. Around the year 1600 more and more people found that the reformation had failed. What initially began with a discussion on the abuses within the church, quickly degenerated into polarisation, religious strife, acts of violence and a belief that was based on the dead letter. From this arose the desire for a genuine reformation of man and mankind that was expressed in e.g. the impulse of the Rosicrucians who came into the open in the seventeenth century in various European countries and which can be regarded as a renewed synthesis of the natural sciences, original Christianity and the Hermetic-Kabbalistic tradition. Thinking in symbols and images was held in high regard with the Rosicrucians of the seventeenth century. Their three manifests are rich in symbols, and the many written reactions that subsequently appeared, contained profound symbolic illustrations, in accordance with the following sentences from the first chapter of ‘Admonition of the soul’ by Hermes Trismegistus. A person in whom science, art and religion form a unity, we could call a universal man. This notion clearly came forward in the Italian renaissance under the name uomo universale or homo universalis. Most of the time it refers to a person who develops all his or her talents and skills in harmony with each other. Leonardo da Vinci (1452-1519) is the classic example of such a universal man. This genius was an architect, an inventor, an engineer, a philosopher, a physicist, a chemist, an anatomist, a sculptor, a writer, a painter and a composer. It is he who drew the picture of the Vitruvius man with his arms and legs spread in a circle and in a square (see image 2 for a styled version). This microcosmic man not only undergoes influences from the macrocosm that affect him, but also consciously creates the desired development on earth. The philosopher Marsilio Ficino (1433-1499) from the early Italian renaissance, was of the opinion that it is not the earth that must be worked, but rather the soul. That becomes possible if man acknowledges himself as a conscious, autonomous creative entity. From this perspective we can regard the renaissance as a specific period in history, as a symbol for the renaissance or rebirth that can take place in ourselves: reawakening the powers from the microcosmic that it possessed in antiquity, from before the fall. They will again come at the disposal of the spiritually striving man who focuses on the royal art of building. Within the academy that Ficino had founded copying Plato’s school in Greek antiquity, the universal man was not so much regarded as a being that should gather as much knowledge as possible, or develop all his talents, but more like a personality in whom the new soul could burn like a spiritual sun on behalf of everything and everyone. The classical Rosicrucians mention three persons in their manifest they considered universal men in the above-mentioned sense, viz. Paracelsus, Christian Rosenkreutz and Hermes Trismegistus. Paracelsus was a historic figure who was regarded as a shining example by the classical Rosicrucians, because he was willing to give up old and rigid theories, to think for himself and do research by consulting his own inner knowledge out of a profound trust in God. He regarded God as the great physician. Christian Rosenkreutz is a mystery name of a high human individuality who has worked in several of his incarnations for the spiritual development of mankind. According to Rudolf Steiner, Christian Rosenkreutz is the leader of esoteric Christianity, who has been incarnated for instance in the master builder Hiram Abiff who built the temple of Jerusalem by order of king Solomon, and as Lazarus who was raised from the dead by Jesus. Hermes Trismegistus is a mystery figure, often viewed as a synthesis of the Egyptian god Thoth, who has brought the art of writing to humanity and thus also wisdom, and the Greek god Hermes, the messenger of the gods. He is the personification of the Hermetic tradition as it appeared in especially the alchemical text Tabula Smaragdina and the series of scriptures that are collectively known as the ‘Corpus Hermeticum’ and which have been translated from Greek into Latin by Marsilio Ficino. In the first manifest of the Rosicrucians, the Fama Fraternitatis R.C. from 1614, they refer to the book T in the hands of Christian Rosenkreutz, about which the Rosicrucians write that – after the Bible – it is their greatest treasure, and which obviously cannot be subjected to the judgement of the world. The book T would refer to Theos (God), Testamentum (Testament) or Thoth. Yet it could refer to the Hermetic scriptures as well, but maybe also to the tarot. The tarot too, is a very well-known form revelation that has by some been attributed to Hermes Trismegistus. Based on the enigmatic and cryptic scripture ‘The alchemical wedding of Christian Rosenkreutz’, we can also regard Christian Rosenkreutz as the prototype of a man who imitates Christ and endeavours to become a Hermes Trismegistus, a thrice great messenger of the gods. Thrice great then refers to the renewed synthesis of spirit-soul, soul and personality-soul, and also to the three aspects knowledge, love and action and the three archetypes king, priest and magician. The three wise men from the East that went to Judea to worship the new-born Jesus, can be regarded as a king, a priest and a magician that have to become active within the new man. These are archetypes that we can also find in the 22 large arcana of the Hermetic tarot, as arcanum 4, arcanum 5 and arcanum 1 respectively. 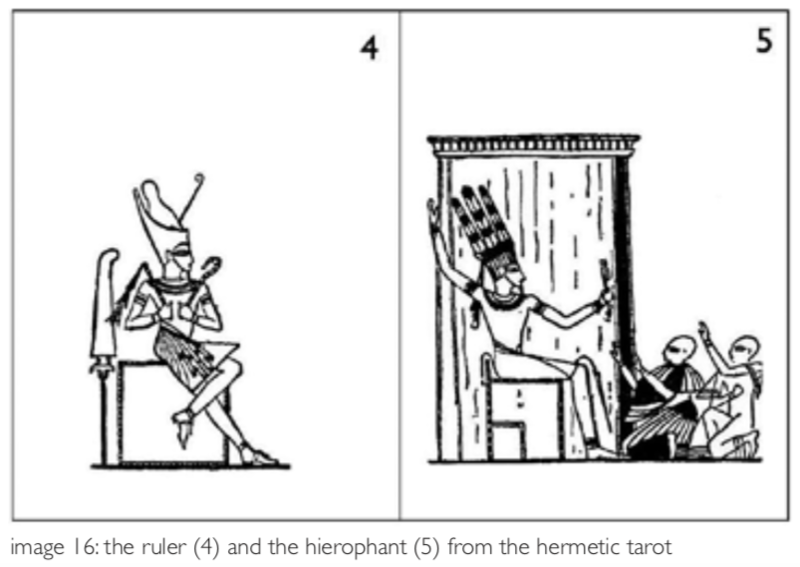 Image 16 shows the ruler (arcanum 4) and the hierophant (arcanum 5). The fool (arcanum 0) and the magician are depicted in image 17. The word arcana is the plural of the Latin arcanum, which can be translated as ‘mystery’, ‘secret’ and ‘hidden to the masses’. The world-famous card deck with the name tarot has an exalted origin in the Hermetic-Christian tradition but has been misused for divination and card games. Many thousands of versions have been made since of the tarot card deck which almost all consist of 78 pictures. That is why they say: every fool has his own deck. There are indications that the original tarot consisted of only 22 pictures, which are now known as the major arcana, and that the other 56 pictures – the minor arcana – were later added by Kabbalists. It is said that initially the tarot was not about cards, but about images in temples of the Egyptian mystery schools. Part of these temples consisted of a gallery the roof of which was supported by 22 columns: eleven on the left side and eleven on the right side. On every column a mysterious image had been painted, full of symbolism. ‘These images contain, in a symbolic form, all that we know. Everything that the gods wanted to reveal, everything that we, as mankind, can comprehend, is present in these images. These images, which we call the book Thoth, who is also the god of wisdom, tell us about the essence of the deity that we serve, about the world and its origin and about the way mankind must follow. If the Egyptian temples and the 22 images mentioned really existed cannot be verified anymore because they have been destroyed. The story goes that priests, because of threatening persecutions, copied the images in a small format and took them with them when they fled. The copies are said to have come into the hands of the nonunderstanding, who used them for divination and gambling games. The high Hermetic wisdom that is hidden in the tarot was hereby downgraded and deformed and the tarot – quite understandably –received a bad name. Over many centuries all kinds of movements have left their marks on it. In spite of all the mutilations and distortions that have taken place, it is still possible today to delve into the gnostic treasure of the 22 images of the Hermetic tarot. Together these images can be seen as the inner structure on which foundation the damaged human microcosm can be reinstated and vivified. In arcanum 1 of the Hermetic tarot, also called the magician, man as a creator is strikingly depicted. The number 1 symbolises the living connection between heaven and earth. The word magician comes from the Persian magu, which refers to someone who has received heavenly gifts (maga). The magician of the first arcanum represents the renewed man, who consciously, and in surrender to the heavenly light, can work with the four attributes that stand on the altar table in front of him, and which the fool of arcanum 0 still has in the bag on his back, which are: the coin, the sword, the cup and the staff. At a cosmic level the coin symbolises the sensory perceptible world, in which activity takes place, as well as trade (Assiah), the sword the astral world of the concrete archetypes (Yetzirah), the cup the world of the abstract archetypes (Briah), and the staff the manifested spiritual world (Atziluth). At the level of man, the microcosm, the coin symbolises the body, the sword the personality-soul, the cup the soul and the staff the spirit-soul. 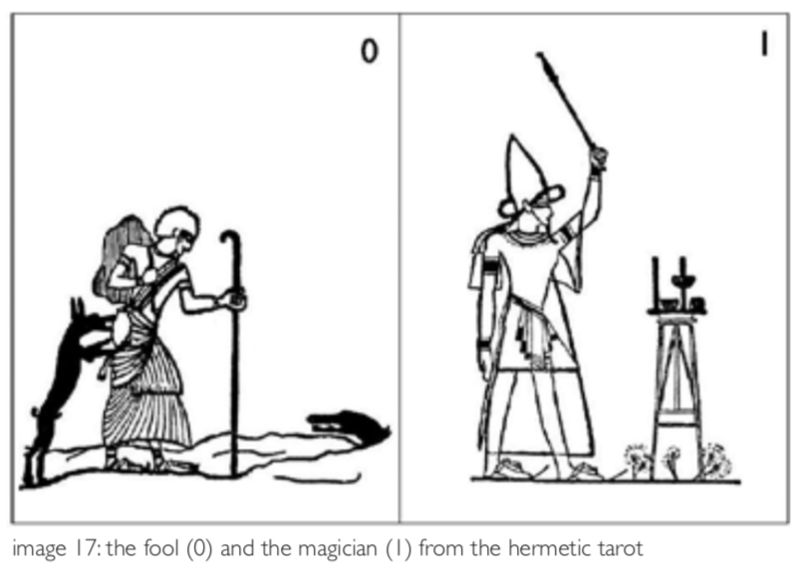 In several respects the image of the magician is opposed to the one of the fool (see image 17). The earth on the fool card is uneven and bumpy, on the one with the magician it is smooth and even. The fool is surrounded by poverty and aridity, the magician with wealth and blooming flowers. The fool moves about laboriously and is threatened by dangers, but the magician knows he is being protected and radiates a concentrated calmness. The magician is a creator: he commands in heaven and creates on earth for the benefit of his fellow men. This is partly possible because he possesses a renewed and transparent soul garment, a renewed serpent fire (symbolised by the staff in his hand and an opened and developed crown chakra (symbolised by the pointed cap). The lemniscate, a horizontal 8, the symbol of eternity, that can be recognised in the cap, refers to the connection with infinity and eternity. ‘What think you, mortals, and how seem you affected now that you have heard that we sincerely proclaim Christ, condemn the pope, adhere to the true philosophy, live a righteous life, and invite – indeed we call and entreat – many (to whom the same light of God likewise appears) to join us in harmonious co-operation? Do you not think, after examining your gifts, after having pondered on the insight you possess in the Holy Scripture, and after having seen how imperfect and contradictory are all arts, that with us you must at least begin to consider their restoration? That you must offer your hands to God, who does the work, and should devote yourself to the demands of this age?